Home » Household » Amazon Echo Input – The Smart Device Music Lovers Have Been Waiting For? Amazon Echo Input – The Smart Device Music Lovers Have Been Waiting For? Back at the Amazon Conference in September 2018, the company announced a whole host of new Alexa-enabled gadgets, from new models of the Echo Dot, Plus and Show to their own smart plug and even a voice-controlled microwave. The one which got the most buzz, however, was the Amazon Echo Input, a device which can promise to turn your existing speakers into voice-controlled appliances. Released on the 12th December 2018, it has proven a very popular device for those who want to make their home a lot smarter. 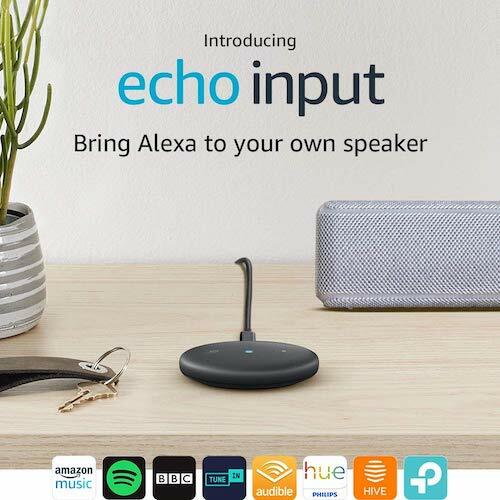 Current Echo’s can control IoT items, but as they include their own speakers, there isn’t really a way to bypass this and get the music to play on your existing speaker instead. It has to play through the Echo, and the sound quality has long been one of it’s biggest downfalls when compared to ordinary speakers. For any music lovers out there who find that audio quality is a vital factor over having the news read to you, this is a letdown. But the Echo Input does not contain a speaker, making it Amazon’s first Alexa device without one. There are four microphones to give you all the benefits of voice control, but it passes the task of giving you sound on to your existing speaker, which is great for your ears. After all, quality is probably why you bought your expensive model in the first place. You connect both appliances together over a 3.5mm audio cable or Bluetooth. When this is done, the speaker can be made part of an existing or new multi-speaker group. It is small. In fact, it measures 14 x 80 x 80 mm. Perfect for adding to your current sound system without interfering or being too obtrusive, and they can even be dotted about the home as placement is not an issue – just make sure it can be plugged in. Now about the price. It is the cheapest Echo item on the market, which is a given as seeing there is no speaker. The lowest-priced Dot model isn’t much more money if you do want something which can play music too, but you’re probably looking at the Input as you want to avoid this. This is great if you’ve spent hundreds on your existing speaker and spending much more would be an issue. Through the Amazon website, you can actually purchase the Input in a bundle with a host of speakers, such as the Ultimate Ears range and Bose, if you were thinking of getting a new one anyway. Keep an eye on more choices being added at a later date. A lot of other reviewers have described the Echo Input as Amazon’s way of making their mark on those serious about sound. They’re letting you use your Sonos, Bose and other highly-rated sound systems, but want to be part of the experience. They’re making the most of the fact that most of these companies are yet to release voice-controlled gadgets and getting in there before they do. A lot of people are comparing it to the Google Chromecast Audio, which allows you to play your music from any device through your non-WiFi speaker over WiFi. But the Chromecast can’t let you control the speaker with your voice, so it now seems a pretty ineffective item in comparison. There is no WiFi connectivity with the Input, just Bluetooth or the audio cable. But this will probably be sufficient for your needs, as most speakers have built-in Bluetooth. So, if you’ve always wished you could just ask your speaker to play a certain song, radio station or playlist rather than scrabbling for the remote, Amazon has made your dreams come true.